Flowers of the blue poppy, Meconopsis Fertile Seed Group. Originally introduced from W China in 1924 as Meconopsis betonicifolia, blue poppies have since interbred extensively in cultivation. 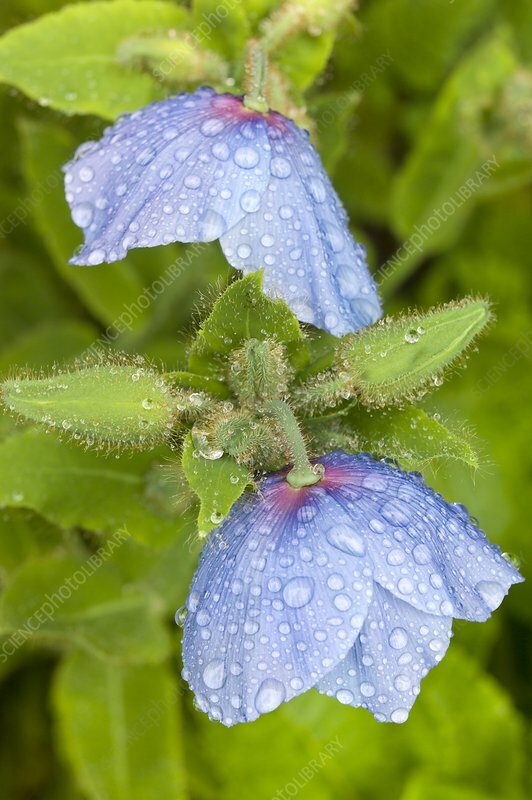 The name Fertile Seed Group has been recommended for all seed-raised blue poppies in recognition of this.The picture shows two open flowers, and was taken after a shower of rain. It depicts two strategies for avoiding rain damage; petals are enclosed in a cuticle, which is microscopically ridged and covered with a wax layer. In addition to this water-repellent skin, the green parts of the flower ( the calyx covering the bud, centre left and right ) are equipped with water-repellent hairs.